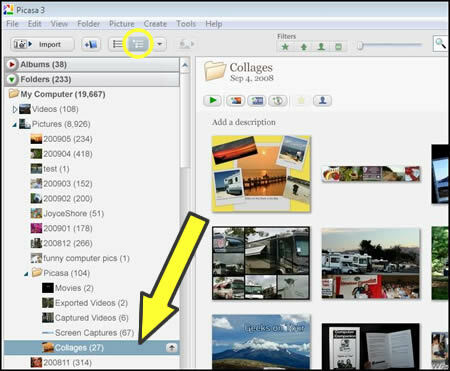 Picasa Tip: Folders and Subfolders – Learn Picasa and Google Photos! The most common complaint I hear about Picasa is that you don’t like how it organizes your folders. I keep explaining that Picasa doesn’t do anything to your folders, it just sees the folders that exist in your ‘My Pictures’ area of Windows XP or Vista. It finally dawned on me that what people objected to is the fact that they made folders and subfolders to organize their photos and yet, when they look at Picasa they don’t see the folders or subfolders in the order they made them. You need to understand the ‘Flat View’ vs. the ‘Tree View’ in Picasa. Although it’s true that Picasa does not *do* anything to your folders – it does display them in two very different ways. And the default way is Flat – which doesn’t look like the nested folders that you see when using Windows. 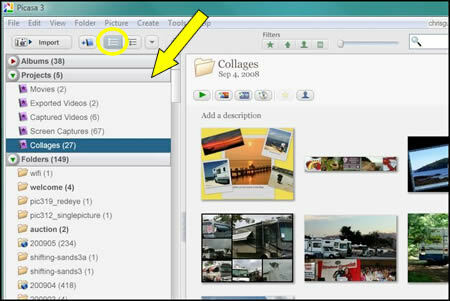 If you’ve ever made a collage, or captured a screen using Picasa 3, you’ve probably noticed the collection called ‘Projects.’ Collages are automatically saved in a folder called ‘Collages’ and it shows up in the Projects collection in the left sidebar. That is … it shows up there *IF* you’re using the Flat Folder view. Notice the button that is circled in the screenshot above. If you’re using Tree view (the button just to the right of Flat View) then the Collages folder is forced to show up in it’s nested location under My PicturesPicasaCollages. It’s not much different than holding a hand of cards … you can put them in order by suit, or by rank – they’re still all in your hand! The very first time I used Picasa – I also didn’t like how it flattened my folders. I have since learned to appreciate the flexibility of that view and I use it a lot. But, if I need to find a folder by knowing exactly where it is on my drive structure – all I have to do is click on the Tree View button. THANK YOU very much. All of a sudden my folders were all looking weird and I couldn’t find things – so a quick google search and bingo, found this page. You have solved my problem: a family member had clicked ‘Tree View’ and I felt lost. All is well now – and I very much appreciate your clear and useful explanation – thank you. hi, what if my HDD does not appear in folder manager , is there a way around it? I have hundreds of book images with a lot of duplicates showing up as folders. I want to get rid of them all. Picassa will not let me highlight them all and delete. I have been doing about 10 minutes a day to individually get rid of them. This is crazy! There must be another way! And I don’t even know where these came from!!! Can you help me? Go to “Tools” in the Bar at the top of the page and click on “Folder Manager”, that should allow you to delete all unnecessary folders in one swipe. I can’t remember the address to get onto Picasa to see my folders and individual photos. Could you help me with this problem? Thanks! Thanks for the tips. I couldn’t find the button to unflatten my folders until now! Thanks! Also, a related point: Images must be placed in a folder that is set to SCAN always. If images are placed in a folder that is set to Scan Once, Picasa won’t display them, because it doesn’t know to look for them. Likewise, if they are placed in a folder that has not been “added to Picasa”. Actually there’s another issue with folders in picasa. Well, actually, with Albums, whatever it saves those. Plus, doing that also screws up picasa “unsaved” edits and, above all, web albums. Since I’d like to pre-select what to go into web albums without messing my photos original folder and without needing to make copies, I thought it’d be a good idea to create an Album and sync it. I’m writing this in hope you tell me I’m wrong. And there’s some glitch or some way to go around those issues. I know this response might be a little late but hope it’s useful for anyone seeking and answer to this issue. If you’re going to use Picasa for organizing and uploading pictures you need to use it to move images from folder to folder so it can keep track of where things are. If you are using file explorer to move/delete images then you break the link between your hard drive and what Picasa has in its database. Using your “Try this” example above, you have to use Picasa for step 5 (go to Finder or Explorer). You do this within the tree view by right-clicking on your “S” folder and selecting “move folder” then navigating to the folder you want to move it to.